This guest post is from Leah Blinstrub, a registered dietitian and health coach with Blue Cross Blue Shield of Michigan who enjoys cooking, being outdoors with her dog Oscar and spending time with her 1 year-old son and husband. Tomatoes: You either love them or hate them. Depending on the season I either love them or pick them out of my food. Michigan summers completely spoil me. Our climate is ideal for tomatoes; we have perfect long sunny days and warm nights. Tomato planting in Michigan starts any time after mid April and the tasty fruits arrive in gardens and farmers markets everywhere 60-80 days later (depending on the variety of tomato). During the summer season few fruits or vegetables rival the delicious taste of a home grown, sun-ripened tomato. But in the dead of winter you’d have to pay me a to eat one of those tasteless, “red” beasts. What’s the deal with grocery store tomatoes? Why do they look like tomatoes but taste like cardboard? The story of the tomato is an interesting one. Identifying a plant’s “center of origin” requires finding the spot with the greatest natural biodiversity. The Andes Mountains in Peru produce eight different wild tomato varieties, making it the most likely center of origin (not Italy). However, evidence suggests that domestication originally took place in Central America. The sneaky fruit is thought to have hitched a ride tucked into other crops such as maize and beans. Civilizations as far back as the Aztecs have recorded the history of the tomato in pictures and recipes. It appears that the tomato made its way across the Atlantic and into Europe around 1521. The popularity of the tomato ebbed and flowed throughout history until about 1820, when it started to soar. A major boom took place with the 1920 birth of mass canning production. Since that time the fruit’s popularity has been on the up and up. With the dawn of biotechnology, hydroponic production and increased out-of-season growing capabilities, the tomato has seen major changes. The main tomato producers in the U.S. are California, Georgia and Florida. The book “Tomatoland: How Modern Industrial Agriculture Destroyed Our Most Alluring Fruit,” by Barry Estabrook, does a great job explaining the unusual circumstances surrounding tomato production in Florida and how part of “winter tomato” taste was born. Turns out, the soil in Florida is mostly sand, which does not hold water or nutrients and isn’t normally suitable for growing much of anything. So how can Florida produce a third of the U.S. tomato supply, and why would anyone try to grow a crop like tomatoes in Florida? 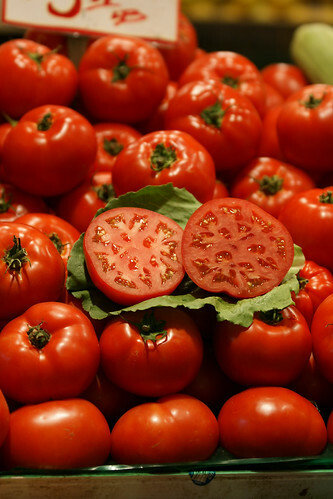 The draw of Florida tomato production is mainly the mild climate and the lucrative capability to produce tomatoes for the Northeast during winter months. The process is not easy; in a nutshell it requires raised sand beds, covered in plastic and watered with a process called seepage irrigation. The tomatoes are picked while still unripe and transported to warehouses where they sit, exposed to ethylene gas for 4 to 6 days, to ripen and appear red. That’s why they look like ordinary tomatoes but taste like nothing at all. Why produce something that is tasteless you might ask? Here’s the conundrum: Growers serve not only grocery stores and fresh markets but the fast food and restaurant business as well. Pay is by the pound, not by how good the food tastes. According to Estabrook, flavor isn’t a concern for many growers, who reckon that what consumers really want is something perfectly red and circular to add to their burger or toss in their winter salads. A similar thought process surrounds hydroponic tomato production, which involves elimination of soil and instead grows tomatoes in perlite, vermiculite or sawdust. The benefits of hydroponic production include greater crop predictability, less vulnerability to weather and season, less need for pesticides and much larger yields. Conventional farms produce up to 60,000 pounds of tomatoes per acre while hydroponic production can produce upwards of 600,000 pounds of tomatoes per acre. That’s quite a difference! With hydroponic growing, it’s also possible to manipulate a tomato’s characteristics. Nutrient profiles can be changed to increase lycopene (an antioxidant responsible for the tomato’s color), shorten cultivation time, and alter and improve taste. According to Lynette Morgan at Greenhouse Product News, taste is impacted mainly by genetics, light, temperature, water stress, raised salinity, fertilizer additions and leaf area. Having the right amount of leaf area is very important for air circulation, but removing too many leaves can decrease the amount of sugar that reaches the plant and decrease sweetness and flavor. However, improving flavor usually decreases yield. Hence the red, often tasteless tomatoes you find in the store. The good news is for the next few months the solution is easy… eat all the fresh, locally grown tomatoes you can get your hands on. Tomatoes thrive in Michigan soil, so there should be no shortage of options. Get the best tasting tomatoes from locally grown sources and farmers markets or try your hand at a home garden. Check back later this summer for all kinds of tomato growing tips and delicious recipes! Good Health On the Road: Is Fast Food Better Than Forgoing a Meal?